We carry an ever-changing selection of gifts for all ages. ​We carry an ever changing selection of gifts for all ages. We are known for letterpress and artisan designed cards, which have developed quite a following. Folks are always popping in for just the right card for a coworker, friend, or loved one. Once you've picked out the perfect card, be sure to look for the perfect gift. ​Among our most popular gift options are original art from our galleries and studios, as well as fountain pens, available in a range of beautiful colors, and gift certificates good for framing, art supplies or gifts in any of our three locations. 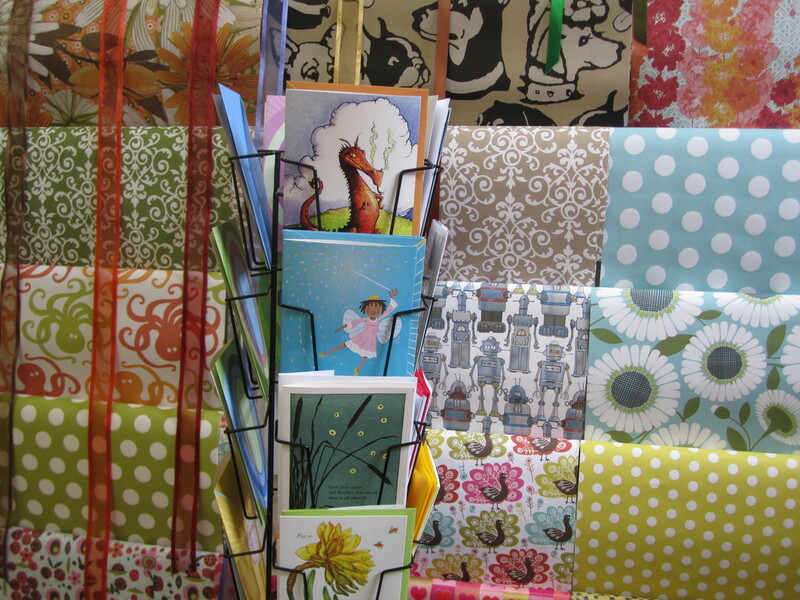 After choosing a gift, check out our beautiful collection of quality wrapping and decorative papers. We also carry a coordinating collection of satin and organza ribbons that are sold by the yard. ​Our sumptuous assortment of chocolates and caramels are popular with artists and gift-givers alike. In our children’s gift department, you can find fun and educational gifts that inspire imaginative play and creativity. ​A highlight of our gift selection is our Sadie’s Satchel Collection of artisan made products. Anne’s great, great Grandmother, Sarah Maria Sherman was a world traveler. Her friends and family called her Sadie, and in the 1890s, she traveled to Europe for what was known as the Grand Tour. As was the norm in those days, she was accompanied by trunks and satchels of enormous size; some to carry the essential clothes, hats, and jewelry of an elegant traveling woman, and some to bring back the treasures that she purchased along her route. We think Sadie would be proud of our new venture—A corner in our store that showcases artisan-made treasures from a single area, all made with love and skill. We are calling it Sadie’s Satchel in her honor, and Sadie’s first travel is to Charleston, South Carolina. The wonders that we bring back from our trip will only be with us until next year. Then, Sadie will be off on another adventure to a city loaded with talented artisans. Come by often to see what’s in Sadie’s Satchel this week! Stacey Bradley is passionate about printmaking, and has been ever since her high school teacher introduced her to it. All of her work begins with the timeless art of block printing. Stacey is in love with the process from beginning to end, getting to use her hands the entire time. Drawing then carving the design, rolling the ink, pressing the back to transfer the image, and then finally pulling up the paper to get the surprise you can only get from hand printing! Each piece is unique and different. Stacey named her company PerlaAnne in honor of her mother. ​Find PerlaAnne cards, tote bags, and dish towels at all three of our locations! Sadie loved her wine and she loved candles. On a visit to the Charleston Farmer's Market we discovered Rewined Candles. These candles are hand crafted in Charleston. Discarded wine bottles are collected, carefully cut to size by hand and then filled with premium natural soy wax scented with a blend of fragrances to mimic the aroma of your favorite varietal of wine. ​We have 12 different types including Sangria, Sauvignon Blanc, Champagne and Zinfandel. Every evening is better with candlelight and the soft scent of your favorite wine. Come by any of our three locations and pick your favorite wine fragrance. Some of that great, Southern food! When Sadie traveled, she filled her satchel with lots of goodies. When she went to Charleston, Sadie fell in love with pecans! Molly & Me Pecans started in 2008 when Kay Holseberg started picking up pecans at her family's farm, trying different recipes, and sharing them with family and friends. Kay harvests her own pecan trees and buys from other local farmers, then cooks them in a cookhouse on the farm. Our favorites are "Sneaky Hot Pecans" and "Sweet Heat". Lots of choices, try one or try them all. What's in Sadie's Jewelry Box? ​​On Sadie's stop in Charleston, Anne and Amanda had the pleasure of visiting Currie Kilpatrick Boyd's Jewelry Studio. As she tapped away, hammering one of her signature gold necklaces, we swooned over her beautiful collection. Every piece of Currie Jewelry is handmade and her designs are classic and versatile. There is truly something for everyone in this jewelry box! Above, you can see what Sadie's got stashed in hers. Give us a call if you're interested in something you don't see at your local Sadie's Satchel. A transfer between shops can happen quickly--just in time for a gift for that special someone!